What is it with kids and stickers? They’re obsessed with the things! I’m already stocking up on sheets of stickers and various sticker activity books for our upcoming 13 hour (eek!) flight. “Yes please!” said DorkySon. “You can put it here on my jacket.” So the nice lady popped a sticker onto his jacket. “I think I need one for my pram too,” said DorkySon. The lady laughed, and stuck one onto the handlebar of his pram. All good advertising I suppose. I could see a mischievous glint starting to appear in DorkySon’s eyes. By this stage I’m getting a bit embarrassed, and I slink behind a display, pretending that this greedy wee boy is nothing to do with me. But fortunately she is game, and sticks one on his grubby looking blue lovey. 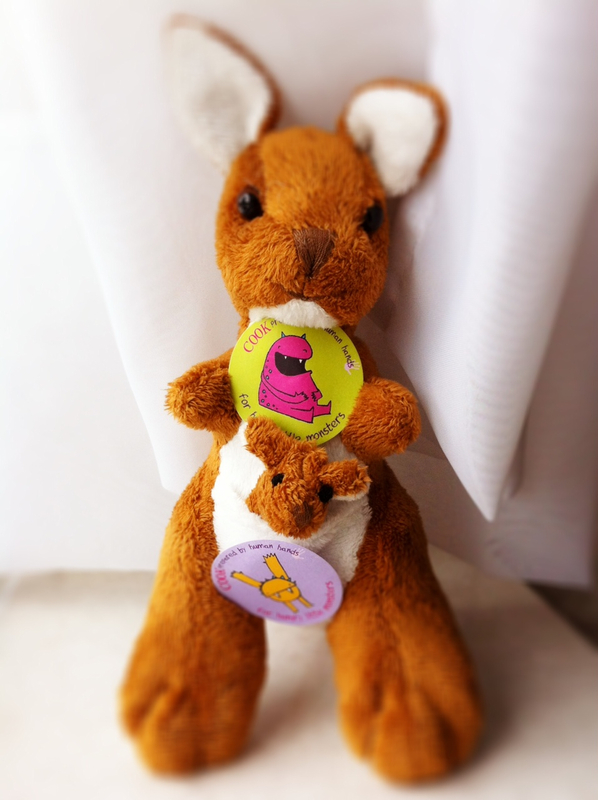 “If Binky has one, then Kangaroo will want one too…” says DorkySon. Slightly less smiley now, the shopkeeper sticks one on Kangaroo, and then attempts to retreat behind the till again. “I think that’s enough stickers now, don’t you?” she says. Five stickers and one mortified Mummy later, we finally manage to escape the shop. I’ve entered this post into the Things they Say and Do linky over at Thinly Spread. If you want to see what mischief the children of other bloggers have been up to this week, head over there and have a wee look! How long was that piece of rope! Dorky Son is clearly a talented opportunist! My only problem with stickers is that the damn things never stick and gravitate to the floor, which is a perfect sticking surface! I love Dorky Son’s style! Back in the good old days of Woolworth’s when my little girl was about 18 months old she would insist on a packet of their stickers every time we went passed. By the time we got home all three sheets would be stuck all over the buggy! Ha ha ha this made me laugh! Oh and by the way I think it’s lovely to have a little explanation of the photograph, this post wouldn’t have been the same without it! hehe I have no idea what the attraction is but there is deffinately somethign about stickers and the more you have the better according to all under 5’s! What I don’t understand is when he just peels them off and crumples them up to make rubbish for his toy bin lorry. What a waste of good stickers! He’s a bright one, your boy. Good idea to stock up on stickers now! Cute! We have pirate stickers everywhere… or, well the amount of them have decreased after I’ve been forced to use my angry-voice when they have been stuck to tables, the floor, windows, etc. Your son is smart to want them on this where they can be removed easily! Fortunately none of them are *too* sticky. DorkyDad has them all over his wallet and briefcase though, which makes me laugh! So funny! Wait till he goes to ‘big school’…he’ll be bribing his teacher!!! Yeah, I’ve had a few tears in class when stickers ‘go missing’ or fall off their uniform…they can become a bit of an obsession with some of the little ones!